One of the biggest security challenges for electric utilities is upgrading the vast number of substation control systems that lack compliant electronic access controls. Ensuring the safety and reliability of our electric grid requires a practical and effective approach to upgrading security across a variety of IEDs, RTUs, gateway controllers and bridges. Additionally, complying with standards such as NERC CIP 003-7, IEC 62443, IEC 62351, FIPS 140-2, and NIST 800-53 require stronger access controls and authentication. In this session, Mocana and GE will present an overview of the cyber threat vectors impacting the grid and ways to defend against them. 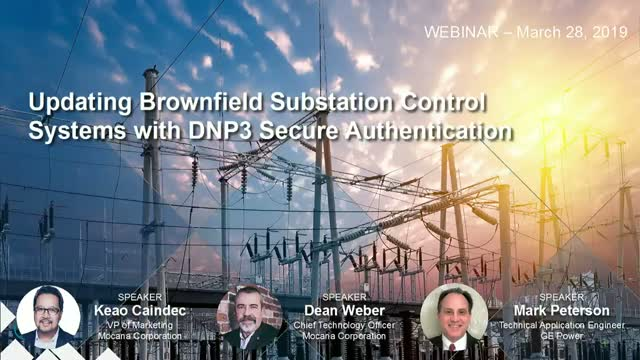 Additionally, an example will be presented on upgrading brownfield substation devices with DNP3 Secure Authentication and stronger cryptographic controls to meet the new and existing cybersecurity standards. Protecting the manufacturing supply chain requires rethinking the way companies develop, manufacture, activate and manage IoT devices. Traditional IT approaches to identity management, enrollment and updates are vulnerable and not scalable. This 3-part webinar series will focus on approaches for making it easier to automate onboarding, enrollment and device management and updates. IoT Industrial Cloud systems are rapidly maturing as packaged systems that can sense, collect, analyze, and action on edge devices. However, the software-based device security and manual/proprietary provisioning methods delivered by platform providers are preventing deployments from scaling. In this webinar, we decompose the industrial data pipeline and demonstrate where device management security services instrumented for hardware security can be applied to build a connected security model that attests, provisions, updates, and manages devices. Automated secure device provisioning without human intervention is the key scaling element to place more devices into service to accelerate value from the Industrial Cloud. When people think about cybersecurity today, they typically think about securing data in motion and at rest or analyzing threats. But when you move into this new Iot connected world, you need to think about more than just the data and monitoring hackers. How do you ensure you can trust the actual IoT endpoint device? This 3-part webinar series will focus on approaches for making devices trustworthy and enabling secure device-to-cloud communications. When people think about cybersecurity today, they typically think about securing data in motion and at rest or analyzing threats. But when you move into this new connected world, you need to think about more than just the data and watching hackers. How do you ensure you can trust the actual IoT endpoint device? This 3-part webinar series will focus on approaches for making devices trustworthy and enabling secure device-to-cloud communications. Trusted Platform Module (TPM) technology is designed to provide hardware-based, security-related functions. A TPM chip is a secure crypto-processor that includes multiple physical security mechanisms to make it tamper resistant, and malicious software is unable to tamper with the security functions of the TPM. This session will cover how Mocana enables the use TPM certified keys to secure Docker containers, LinuX Containers (LXCs) and VMs on industrial IoT gateways and endpoints. Open source security software has made it easy for developers to get started with securing IoT devices. In this webinar (Part 3 in a 3-part series), you’ll hear from industry experts on how to migrate off of open source security and SSL libraries with Mocana. The industrial Internet Consortium (IIC) has released the Endpoint Security Best Practices (ESBP) document that provides recommendations on the type of security industrial equipment manufacturers and operators should implement on endpoint devices. In this webinar, industry experts will provide an overview of the recommendations and demonstrate how to approach implementing the guidance. Open source security software has made it easy for developers to get started with securing IoT devices. In this webinar (Part 2 in a 3-part series), you’ll hear from industry experts on the hidden compliance challenges and support costs of using open source security. Open source security software has made it easy for developers to get started with securing IoT devices. In this webinar (Part 1 in a 3-part series), you’ll hear from industry experts on the hidden vulnerabilities and risks of using open source security software, especially for resource-constrained devices and IoT. • Provide recommendations and best practices for ensuring the safety and reliability of industrial control and safety systems. We look forward to having you join us for this informative session. Protecting connected networks and the Internet of Things (IoT) is critical to ensuring data privacy and security of systems. In this webinar, you'll learn about hacking scenarios and defending against common cyber attack vectors. You'll also learn about the important differences between IoT threat detection and device protection and how to reduce your cyber risks. Cyber attacks are on the rise and becoming more dangerous impacting the safety of smart cities, smart homes and the Industrial IoT. Stuxnet, Black Energy, Mirai, Brickerbot and Wannacry cyber incidents have used a variety of vectors of attack on IoT and industrial control systems made possible by vulnerable devices and a lack of strong cybersecurity controls. Hackers are not just interested in stealing data; they want control and can significantly impact the safety and reliability of systems that affects the risk profile of a company. - How create a chain of trust workflow to harden devices and ensure secure communications. Dean Weber, CTO of Mocana, is an expert in cybersecurity for embedded systems, IoT and industrial control systems. He has more than 30 years of experience in security, cybersecurity and information systems, Dean is a trusted advisor to CISOs at Fortune 1000 companies. Prior to Mocana, he was the CTO of Applied Identity, which was sold to Citrix. He spent several years in the U.S. Navy working in physical and electronic security. Mocana Corporation CEO Bill Diotte discusses the importance of private companies and the government working together on cybersecurity solutions and cultivating talent. Mocana's Bill Diotte for an in-depth conversation on the current state of information security, today's threatscape and a discussion on the cyber industry.